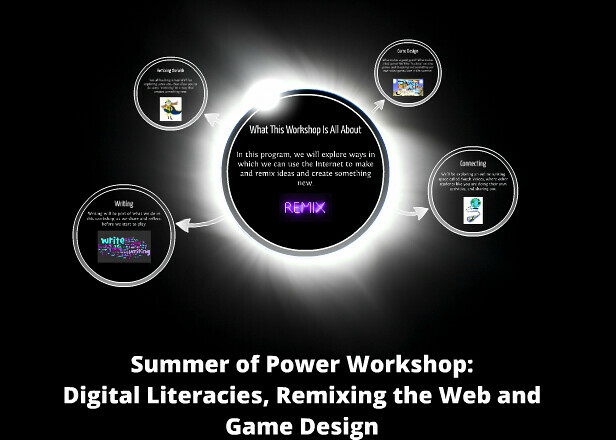 I haven’t written much about this, since I have been knee-deep in the Making Learning Connected MOOC, but today is the first day of a five-week workshop program I am leading for high school students around digital literacies, remixing the web and game design. I’m a little jittery. You know that feeling? My workshop is part of a partnership between the Western Massachusetts Writing Project and a local urban school district, which got a big grant to offer up a comprehensive program to support English Language Learners this summer. There are tutorial sessions, group activities, work programs and workshops in this Summer of Power program. I am one of the workshop leaders. Along with a WMWP colleague, who has expertise in ELL, I am going to have these high school students explore the digital worlds from a couple of angles — first, through creating avatars to represent themselves in a webcomic space and beyond; then into remixing websites with the Mozilla Webmaker tools; and then into video game design with Gamestar Mechanic. Meanwhile, I am weaving in game design from the very first week (tomorrow, we hack the game of Chess, for example). Writing will be at the heart of what we are doing — from writing in and out of the day, to storyboarding projects, to reflecting on the experience and possibilities. I am working to line up some outside visitors, too, from the field of computer programming and video game design, and I am reaching out to the Mozilla folks, too. I don’t know the students, and I have not worked much with high school students, and the language barriers are somewhat of an unknown. Yet today, I have to give an elevator speech (15 minute presentation) six times, to six different groups of students, as they will be deciding which enrichment workshop they want to attend. I am using Prezi to present my overview, but I decided to start with a non-threatening quiz — showing icons from the gaming world and I’ll ask if they recognize them (we’ll be using a lot of visual clues this summer). There is one outlier in the mix (Mr. Monopoly) who does not originate from a video game. We’ll see if they can pick him out of the lineup. What has me on nerves, though, is not the students, so much. Since this is not my school, I worry about the infrastructure of technology and whether things will work as I need them to work, and what kind of support I will get when they don’t. I did visit the lab last week, checked out the computers, and found a few upgrades that needed doing. The teacher there is fantastic, and she got to work on the upgrades even as I was leaving the lab. She wants it to run smooth. That’s a great sign. We’ve had maps on our minds at the Making Learning Connected MOOC this week. You’d be surprised (or not, if you are in the MOOC) by the range of mapping that went on — from typical geographical maps, to metaphorical maps, to maps that were flowcharts mapping out an idea. And lots more in-between. Maps are interesting things, aren’t they? They help us shape our world. We make maps to put ideas and people and places into some semblance of order and connections. Maps are heuristics, a way to make sense of things that at first seem beyond making sense. Maps are also place markers. They document where we’ve been, and where we are going, and how we are going to get there. 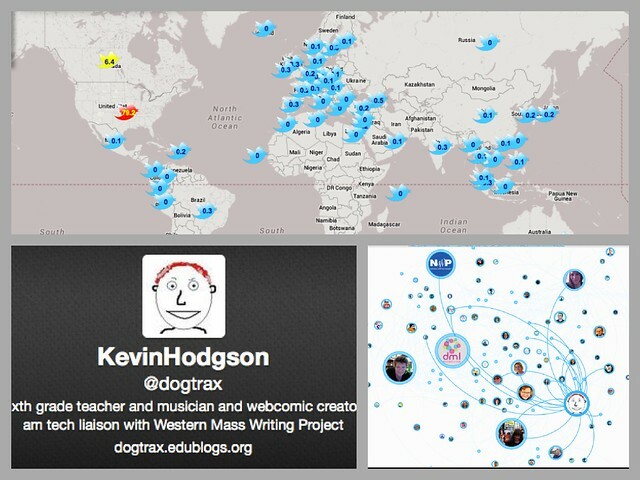 The top map (via Tweetsmap) in the collage shows followers from around the world. That map is not nearly as useful and as interesting to me as the other one because I don’t “see” connections in the top one. I just see data points, and data points without context are not all that useful. In the bottom map, in the live version, you can follow the linking lines, and watch as other connections unfold, and the web that comes into play makes you realize that we are immersed in the connected educator movement. The map makes that more visible than ever. The other day, I was thinking about maps in connection to literature because my youngest son and I were immersed in “reading” a map that is part of a book we are reading aloud (The Familiars). He was running his finger along the river crossing the world, and asking about the names of these imaginary places, and I realized how important this map was to him, the listener of this story, as we situate ourselves as readers to a magical place beyond our view. This map was a document we come back to regularly as we read, following the heroes on their journey. The same thing happens with maps in other books we read. When we start a read-aloud, we often turn to the first and last page, searching for a map to orientate us to the story. The question of whether making maps is “writing” and interpreting maps is “reading” — and thus, part of literacy came up in a few discussions this week — and I would argue, yes. What about you? Here’s an interesting look at how one teacher — Sarah Brown Wessling, from The Teaching Channel — uses a video camera to capture what she is doing in her classroom, as part of her reflective practice. Anyone else do this on a regular basis? Now here is a pleasant surprise: a female protagonist in an adventure/action graphic novel story, whose wit and expertise carry the day. In Delilah Dirk and the Turkish Lieutenant, by Tony Cliff, the heroine — Delilah Dirk — meets up with Erdemoglu Selim (the lieutenant), strikes up a friendship in the midst of escaping one trap or another, and moves on to even more danger in her life as a freewheeling spirit whose never known to pass up the possibility of treasure, no matter how dangerous it might be. 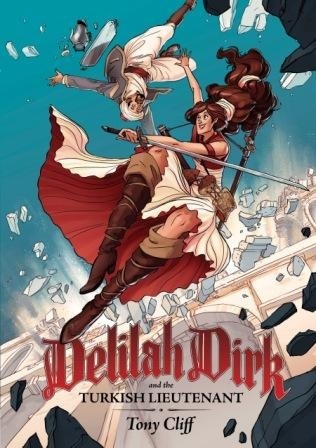 This book by the publishing company of First Second evolved from a webcomic series that Cliff has been developing and publishing online, but I enjoyed the adventure book without knowing a single thing of the backstory of Delilah Dirk. Her swashbuckling energy drew me right into the story. In fact, I found it fascinating to catch a glimpse of her character through her actions, although Cliff focuses more on Selim as the psuedo-narrator of the story here, which begins when Selim is kicked out of his job because of Delilah, is almost executed because of it and then has his life saved by the story’s heroine. There’s a breathless rush of action here, sort of like Indiana Jones, and the artwork is beautiful. We never quite resolve how a woman of Delilah’s talents conflicts with the mores of the Turkish society (male-dominated) but I appreciated Cliff’s restraint from developing a love interest between the two main characters. In fact, Delilah is not sexualized at all, although she is beautiful in mind, spirit and intelligence. Plus, she’s the most skilled sword fighter in the book. And did I mention her flying ship? There’s a lot to appreciate in Delilah Dirk and the Turkish Lieutenant and I look forward to more adventures. 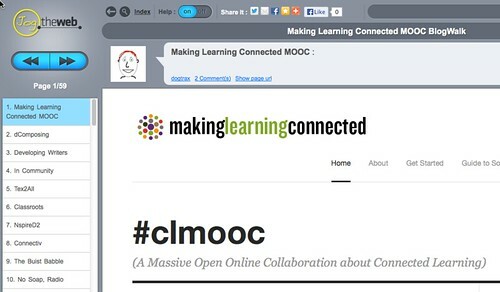 Yesterday, one of the questions I wondered about is whether folks in the Making Learning Connected MOOC are writing and sharing in spaces beyond the typical field of vision. The answer is “yes” and one of those spaces are on their blogs. There is a Blog Hub at the main MOOC website, but I was also curious about how to collect all of those blogs together. I decided to use Jog the Web and encourage you to take a blogwalk through the field of blogs, where folks are doing sharing and reflecting. Another view on Jog the Web is the Index view. If you are in the MOOC and blogging, be sure to add yours to the Blog Hub and drop me a note here, so that I can add you into the Blogwalk, too.